A personalized gift idea for Guardians of the Galaxy fan in your life. A joyful way to sip in your coffee and other drinks with this cute baby Groot mug. A handmade mug made on a pottery wheel, then molded and carved, bisque fired, painted and glazed inside with food-safe lead-free glaze, then fired the second time. Got kids at home? Are they fan of Guardians of the Galaxy? If yes, they must gonna like this cute baby Groot toy figure. A stylized POP vinyl baby Groot toy figure for the toddler. 3¾ inches tall and makes a perfect gift idea for even adult fan of Guardians of the Galaxy 2. This isn’t just another action figure from the Marvel series. Ever expected to dance with your favorite Groot? This is dancing Groot which will actually dance with you. This 11.5 inch Groot figure got internal music to groove but can also detect external music to dance to songs and playlist. A pair of socks to show your fanatic spirit for Guardians of the Galaxy. Slip into these awesome looking Guardians of the Galaxy Groot Crew Socks with all over the knitted-in image of Groot’s face. A perfect Marvel gift for Guardians of the Galaxy fan in your life. 98% polyester, 2% spandex for comfortable wear. Get ready for the Halloween party or to prank your kids. 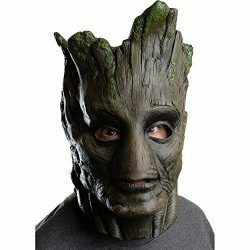 Inspired by the blockbuster movie: Guardians Of The Galaxy official licensed Groot mask. A Groot mask with a real wooden look. One size fits most teens and adults. Inspired by Guardians of the Galaxy a ceramic Groot coffee mug by funko. Sip in your morning coffee with the Groot. A perfect gift for fans and collectors alike. The eyes on this coffee mug make it even cuter. I Am Groot, Yeah! Its enough to welcome a Guardians of the Galaxy fan. A handmade doormat for the fans of Groot. Let this baby Groot welcome your guests with his adorable words that only rocket raccoon can understand “I Am Groot”. Gift it to the Groot fan in your life and can also be used as a housewarming gift. A newly discovered word from Groot “I was Groot”. Guardians drink wooden 3D coasters set makes a perfect housewarming gift for the Groot lover in your life. Comes in real wood or a plastic filament based on your desired color. A perfect hunt for Marvel gift items.